Brainard F. Smith (see biography of Brainard Fowler Smith) of Sacramento was a holder of two patents for key adding machines (US360118 from 1886 and US363972 from 1887). 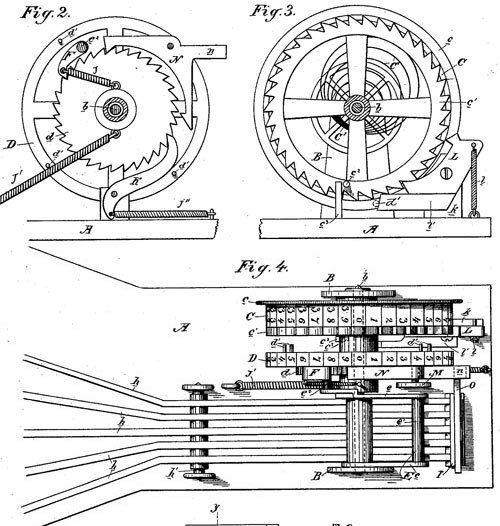 The second patent (US363972) was granted to Brainard Smith and Arthur Shattuck and was implemented later in the famous keyboard adder Centigraph. 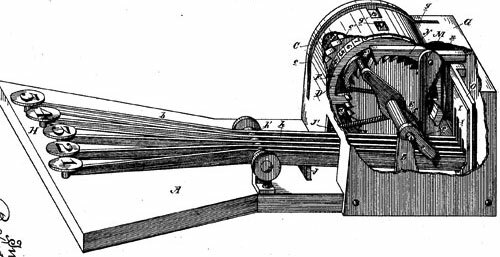 Let's examine the operation of the first adding machine of Brainard F. Smith. By pressing down any of the keys the yoke (E) is elevated at its lower end, thus depressing the extended upper end of one of the arms (e), whereby the pawl (F), which is mounted upon it, engages the ratchet wheel (d) and turns the disk or wheel (D) forward. The disk or wheel (D) is provided on its periphery with the integers or digits from zero up, and with several series of these around the entire circumference. It is the intention in this machine to make one of the keys turn the disk or wheel (D) one space or number, another key to turn it two spaces, another three, and so on, according to the number of keys; and as it has been shown five here, it is obvious that the fifth key will turn the wheel or disk five spaces or numbers. The key on the extreme right is here shown as the unit-key, while the one on the extreme left is the 5-key. It is obvious, that instead of having five keys, we could have nine, here five keys are used for the purpose of convenience, as it is easier to operate them with the fingers of one hand, and the same result can be obtained by touching two of the keys consecutively to form whatever number above 5 which may be before the operator. If any number up to 5 is to be added, a single key corresponding to that number is operated. For a 6, the 5 and the l may he operated consecutively, or the 3-key may be operated twice, or the 4-key and the 2-key may be operated consecutively, according to the will of the operator. Both wheels are set at 0. First press the 1-key, whereby the figure 1 on the disk D appears at the aperture in the casing. Then operate the 4-key, whereby the figure 5 appears. Now for the 7, you touch consecutively the 5-key and the 2-key, whereby the figure 2 appears at the aperture over the wheel (D), and the figure l appears at the aperture over the wheel or disk C, which represents the tens, the movement of the wheel (C) being accomplished by one of the pins d' on the wheel (D) coming in contact with the arm (l') of the escapement-pawl and momentarily relieving said pawl from its engagement, whereby the spring (C') of the wheel (C) throws it forward one space, when it is caught by said pawl again. You now write down the 2 under the first column and have the 1 to carry; but you have first, before proceeding to add the second column, to adjust both wheels back to 0. I do this by touching enough of the keys to cause the wheel (D) to turn to the next 0, and then, with the thumb pressing upon the milled rim of the flange (c) of wheel (C), turning said wheel back to 0. Having now 1 to carry, you touch the 1-key and proceed with the second column, thus: For the 7, the 5 and the 2-key; for the 8, the 5 and the 3-key; for the 8, the 5 and the 1-key, consecutively, which will give us the result at the two apertures the figures 22. You now write down the 2 and again adjust the machine, as before described, by bringing both wheels back to 0. Having 2 to carry, you touch the 2-key, and then proceed with the last column. You touch the 5 and the 4 for the figure 9, then the 5, and next the 3, so that you get the figures 19 appearing at the apertures in the casing, which figures you set in proper place for the result.